With the 2014 Sochi Olympic hockey tournament in full-swing, Jaromir Jagr is showing that he is still one of the top players in the world. The Czech superstar celebrated his 42nd birthday during the opening round of the tournament, the day the Czech's played their third round-robin game of the tournament against Switzeland. Now appearing in his fifth Olympic Games in Sochi, Jagr can also look back to 1998 for a little inspiration, the year he and his Czech teammates ruled the world. It was 16 years ago when Jagr helped deliver an Olympic men’s hockey gold medal to the Czech Republic for the very first time. The Kladno native is hoping that the 2014 edition of the Czech national team can again conjure up some Olympic magic. The fifth overall selection in the1990 Entry Draft, Jagr is one of the most decorated hockey players to ever skate in the NHL. He won consecutive Stanley Cups in 1991 and 1992 with Pittsburgh. He has won the Art Ross Trophy as the NHL scoring champ on five occasions, received the Ted Lindsay Award, formerly called the Lester B. Pearson Award (the Players’ choice for most outstanding player) three times, and a Hart Memorial Trophy as the league's most valuable player in 1999. He’s struck gold four times internationally, including two World Championships triumphs (2005 and 2010). And even though he is celebrating his 42nd birthday here this week, the ageless star isn’t ruling out the possibility of lacing up the skates in 2018 when the Olympics take place in South Korea. Jagr, who moved into the No. 10 spot on the all-time assists list, passing Hall of Fame legend and former Pittsburgh Penguins teammate Mario Lemieux with a pair of helpers in the Stadium Series contest against the New York Rangers in January, has still got game. Jagr certainly knows a thing or two about playing in Russia as well. The right-winger suited up with Avangard Omsk of the Kontinental Hockey League for four seasons, winning the KHL Continental (Kontinental) Cup in 2011. He was also part of the Czech side that won the 2005 European Champions Cup in St. Petersburg, Russia. 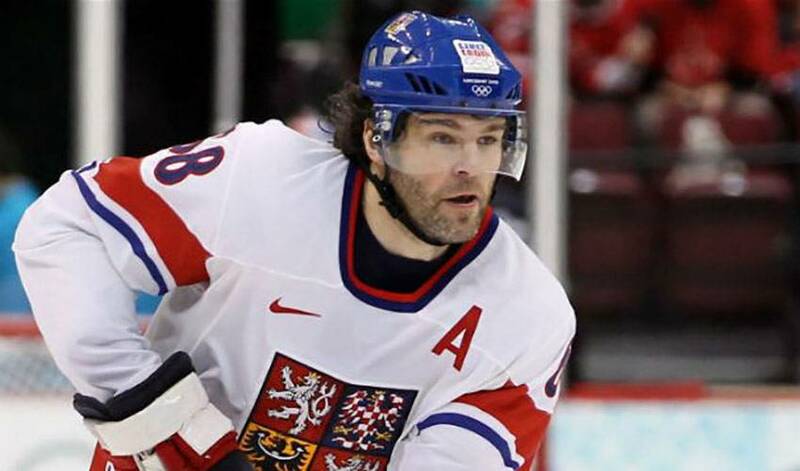 Jagr’s quest for gold continues on through Group C on Tuesday with an elimination match-up versus Slovakia. The Czech Republic native has amazed wherever he’s played, and we’ve gathered the top tidbits that represent the player that there just simply aren't enough words to describe. The legendary Czech-star moved into 4th spot in the overall NHL goal scoring list on Sunday night, making him the NHLPA.com Player of the Week!